Sometimes various problems prevent WinDbg from attaching to a process. I experienced some recently, that I have described here. If you get this error message, please check if the process is 32-bit or 64-bit. Then try attaching again with the right version of WinDbg. Attaching 64-bit WinDbg (x64) to a 32-bit process is possible, but it’s usually not very useful. That’s because it shows a WOW64 view of the process, which limits the debugging options. This error may occur if WinDbg has insufficient permissions. Try running WinDbg “As Administrator” and try attaching to the process again. 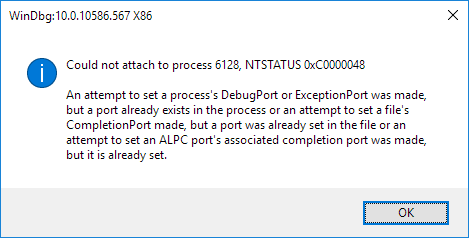 An attempt to set a process's DebugPort or ExceptionPort was made, but a port already exists in the process or an attempt to set a file's CompletionPort made, but a port was already set in the file or an attempt to set an ALPC port's associated completion port was made, but it is already set. This problem usually occurs if the process is already being debugged. 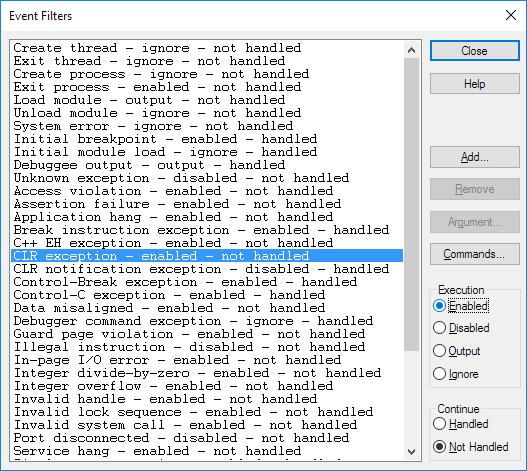 The other debugger could be Visual Studio, ProcDump or another tool. Check if other debuggers are attached, detach them and then try attaching to the process again with WinDbg. I recently needed to use classes and methods from MSXML6.dll in Reporting Services reports (to make web service calls). However it failed with a SecurityException, but the exact cause was unknown. I checked the mscorlib.dll code for System.Security.CodeAccessSecurityEngine.CheckSetHelper(…) in ILSpy. Noticed something interesting: The local variable permThatFailed could show which permission was missing. This was also used when calling System.Security.SecurityException.MakeSecurityException, so that was an ideal place to set a breakpoint. The permThatFailed parameter consistently had the value 2. The SecurityException occured because permission to execute unmanaged code was missing.